"Dear America, appreciate your allies, after all you don't have that many," Tusk said on the eve of the summit. Twenty-nine NATO countries are set to hold tense discussions over two days in Brussels. NATO countries are preparing to meet in Brussels for one of the most challenging summits in years as US President Donald Trump and European Council President Donald Tusk exchanged stern words over European defense spending. 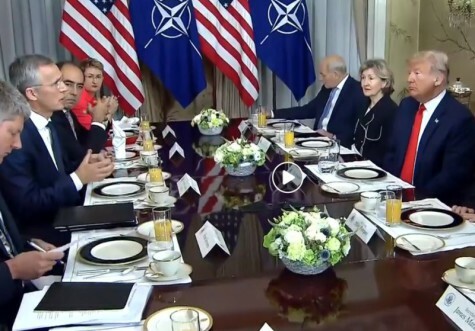 Shortly before arriving in the Belgian capital, Trump lashed out once again at European NATO members for failing to meet the alliance target of spending at least 2 percent of GDP on defense. "Many countries in NATO, which we are expected to defend, are not only short of their current commitment of 2 percent (which is low) but are also delinquent for many years in payments that have not been made. Will they reimburse the US?" he wrote on Twitter. In Brussels, Tusk lamented Trump for "criticizing Europe almost daily" and said the president should acknowledge that Europe is the US' closest ally. "Dear America, appreciate your allies, after all you don't have that many," he said. The spat over defense spending is set to dominate the two-day meeting where leaders are also expected to sign off on a new rapid reaction force, increased funding for Afghan security forces and an invitation for Macedonia to join the nearly 70-year-old alliance. Only eight members of the 29-strong bloc are expected to spend at least 2 percent of their GDP on defense in 2018 — the US, Estonia, Greece, Britain, Latvia, Lithuania, Poland and Romania. Germany's defense spending is currently 1.24 percent of its GDP. The meeting is also taking place amid heightened tensions over US tariffs on European steel and aluminum imports and Trump's withdrawal from a nuclear deal with Iran that many European countries are eager to save. In a signal to European allies, the US Senate voted on Tuesday 97-2 in a non-binding resolution in support of NATO. NATO is preparing for a contentious summit this month, primarily due to the posturing by U.S. President Donald Trump ahead of the meeting. He has made it clear that he is unhappy - and Berlin is target number one. This was the site chosen by the U.S. Embassy to host its Fourth of July party last Wednesday. "Tempelhof is one of those landmarks that show how much we mean to each other," said the outgoing chargé d'affaires. And U.S. President Donald Trump's new man in Berlin, Richard Grenell, said he felt humbled in the presence of so many people dedicated to trans-Atlantic relations. At NATO, the trans-Atlantic military alliance, there is fear now that he will soon take the next destructive step, and Washington's European allies are nervously anticipating the forthcoming summit next week in Brussels. Most alliance members outside of the U.S. expect Trump to pick his next fight at the meeting. "NATO is facing its biggest crisis since its founding," said former NATO secretary general, Anders Fogh Rasmussen. He says he is concerned that the NATO summit could end up being as big a disaster as the G-7 was. Specifically, Rasmussen is worried about Trump sparring publicly with his allies before paying court to Vladimir Putin four days after the NATO gathering, when he is scheduled to meet the Russian president in Helsinki. Click here for the full story, on the Der Spiegel website. BRUSSELS --- European Council President Donald Tusk has admonished U.S. President Donald Trump amid tension on the eve of a NATO summit, saying that the U.S. president has been "criticizing Europe almost daily" over defense spending and urging the United States to "appreciate" its allies. Tusk spoke at a news conference after the signing of a new agreement on cooperation between the European Union and NATO on July 10, a day before the start of a summit of the Western alliance in Brussels. "I would like to address President Trump...who for a long time now has been criticizing Europe almost daily for, in his view, insufficient contributions to the common defense capabilities and for living off the U.S.," Tusk said. "Dear President Trump, America does not have and will not have a better ally than Europe." He added: "Dear America, appreciate your allies -- after all, you don't have that many," and also urged European countries to "spend more on your defense because everyone respects an ally that is well-prepared and equipped." At around the same time Tusk was speaking, Trump was tweeting ahead of his trip to Europe -- and reiterating his calls for European NATO members to spend more on defense. "Getting ready to leave for Europe. First meeting -- NATO. The U.S. is spending many times more than any other country in order to protect them. Not fair to the U.S. taxpayer," Trump wrote on Twitter. "NATO countries must pay MORE, the United States must pay LESS. Very Unfair!" Trump has been insistently urging NATO countries to fulfill their goal of spending 2 percent of their gross domestic product on defense by 2024. Some European officials have expressed concern that his trip to Europe -- which also includes a visit to Britain and a July 16 summit with Russian President Vladimir Putin in Helsinki -- could end up undermining transatlantic unity. There are also concerns that Trump could make concessions to Putin at a time when many Western governments are concerned about Russian actions such as the seizure of Crimea and support for separatists in eastern Ukraine, backing for Syrian President Bashar al-Assad, and alleged meddling in elections in the United States and Europe. As he left the White House to head for Brussels, where he is due to arrive late on July 10, Trump was asked by a reporter whether Putin is "a friend or foe." "I really can't say right now. As far as I'm concerned, he's a competitor," Trump responded. "I think that getting along with Russia, getting along with China, is a good thing." Of his meetings in Brussels and Britain and with Putin, he said: "Frankly, [the meeting with] Putin may be the easiest of them all -- who would think? Who would think?" The United States has "a lot of allies. But we cannot be taken advantage of. We're being taken advantage of by the European Union," Trump said. Referring to European members, he said U.S. spending on NATO "helps them more than it helps us." Аnother post to Twitter, sent out while Trump was en route to Europe, suggested that NATO members should reimburse Washington for its defense spending. "Many countries in NATO, which we are expected to defend, are not only short of their current commitment of 2% (which is low), but are also delinquent for many years in payments that have not been made," he wrote. "Will they reimburse the U.S.?" Amid questions in Europe about Trump's commitment to NATO, alliance chief Jens Stoltenberg said the declaration signed in Brussels was a "strong commitment to strengthen the cooperation between the European Union and NATO." He said the declaration builds on one that was signed in Warsaw in 2016 and that had brought NATO and the EU to "an unprecedented level of cooperation" that would now be exceeded. "In the months ahead, we will step up our cooperation on military mobility, which is essential to our deterrence and defense. We will also work together to respond to hybrid threats and to counter terrorism," Stoltenberg said. Europe is "taking more responsibility for its security" through separate arrangements that complement NATO, he said, but "NATO remains essential to Euro-Atlantic security." Stoltenberg said that eight NATO allies were expected to meet the defense spending target of 2 percent of GDP this year: the United States, Estonia, Greece, Britain, Latvia, Lithuania, Poland, and Romania. "European allies and Canada should not increase defense spending to please the United States," Stoltenberg said. "They are increasing defense spending because it's in their own security interest to do so." In a conference call with reporters July 10, the U.S. ambassador to NATO, Kay Bailey Hutchinson, tried to allay concerns among allies the United States was backing away from NATO, or from the alliance treaty's Article 5, which stipulates that an attack on one member is considered an attack on all. Trump "is committed to Article 5 protection just as it is in the NATO charter," she said. "He is committed to it. And I think that any indication that we're walking away from the NATO charter and the commitments that we've made would be erroneous. "We are committed to Article 5. We are committed to the NATO alliance. We believe that the NATO alliance strengthens America because we speak with 29 voices to a Russia that is one, to an Iran that is one, to a North Korea that is one. We are 29 and that strengthens us all," she said. WASHINGTON, D.C. --- Today, House Armed Services Committee Ranking Member Adam Smith (D-WA), House Foreign Affairs Committee Ranking Member Eliot Engel (D-NY), and 42 other Democrats from the Armed Services and Foreign Affairs Committees released the following statement on President Trump’s attendance at the NATO Summit and his meeting with Russian President Vladimir Putin. “President Trump must not seek to undo the work that generations of American men and women have done to help defend and uphold democratic values throughout the transatlantic region. Europe returned from the devastation of the Second World War to prosperity largely due to the North Atlantic community’s commitments to its shared values and to collective defense. “The signals regarding potential outcomes that are coming from this administration in advance of the President’s upcoming trip to Europe are deeply concerning. Without question, in his upcoming meetings with NATO and President Putin, President Trump must continue to affirm America’s commitments to our allies, especially Article V of the Atlantic Treaty. He must not praise, condone, or abet any Russian efforts to undermine the sovereignty or democracy of any of our allies and partners. He must take a genuine stand against Russia’s cyber campaigns and its efforts to interfere in our elections. “President Trump must recognize the importance that our forward military presence and joint exercises play in deterring Russia and ensuring military readiness. He must not weaken this posture or suspend or cancel these crucial activities, nor emulate Russian propaganda attempting to discredit them. “He must stand up for Ukraine’s sovereignty over Crimea and against the illegal occupation of Ukrainian territory and maintain sanctions until the conditions in the law are met. He must follow the law passed every year through the National Defense Authorization Act prohibiting military-to-military cooperation with President Putin. And he must continue to stand by NATO’s open door policy on the admittance of new members. Poland is expected to use the Brussels meeting to urge a greater presence in Eastern Europe. Warsaw is also lobbying for what it regards to be a key guarantor for stability: a permanent US troop presence in the country. NATO is currently debating plans to expand its rapid deployment forces, but that in itself is not a true safety guarantee for Warsaw. Polish Defense Minister Mariusz Blaszczak welcomes the new "4 x 30" NATO initiative that aims to significantly raise the troops' preparedness by 2020 but he only sees "real military potential" on the US side, and not among European NATO partners. "We're striving for a permanent US troop presence," Blaszczak said, arguing that this is important for Poland and the Polish people. Thousands of US soldiers have been stationed in Poland since 2017 in the framework of the "Enhanced Forward Presence" NATO initiative. These troops rotate every few months, and their numbers are not set. As far as the Polish government is concerned, only permanent military bases equal security. And Warsaw is prepared to pay. A document entitled "Proposal for a US Permanent Presence in Poland" surfaced in the media in May, with the Polish government urging permanent deployment of a US armored division in the country. The Poland government will offer significant funding for this action, about $1.5 billion to $2 billion, "as it is important to share the burden of defense spending," according to the document. The Polish Defense Ministry confirmed the document, which was not kept secret but sent to various institutions and think tanks, as real. The government argues it feels threatened by Russia. The US Senate Defense Committee has suggested the Pentagon assess the Polish proposal. Recent media reports about US President Donald Trump's alleged plans to withdraw troops from Germany and move them to Poland raised hopes in Poland. The reports were denied, but a new debate about a permanent US military presence in Poland was already underway. No matter their political convictions, most Poles – and not just supporters of the national-conservative PiS (Law and Justice party) government – are in favor of the plan. According to a recent opinion poll by the CBOS polling institute, 67 percent of Poles are in favor of stationing US soldiers permanently in the country. The 1997 NATO-Russia Founding Act forbids stationing troops permanently on the alliance's eastern flank, but Warsaw doesn't see that as a problem. The Act also obligates Russia to limit troop deployment in Europe. Polish experts argue Russia breached the Act four years ago when it annexed Crimea. Poland would also regard a permanent US presence as a reward. The country has long been a model NATO member state because it is one of the few states that actually spend the required 2 percent of the GDP on defense. At a press conference with German Chancellor Angela Merkel in Washington in April, Trump sharply criticized an imbalance in payments in the alliance, while he praised Poland for its NATO commitment. "We appreciate it," he said. The NATO states' financial readiness is one of the issues sure to be addressed at the NATO summit in Brussels. Poland also plans to shine a light on the entire region at the summit. A statement by the Bucharest Nine states last month stressed the importance of "further strengthening of the Alliance, most notably its deterrence and defense posture," as the countries "remain fully committed to implementing all the initiatives developed as part of NATO's forward presence on the Eastern flank." The group that has since 2015 been trying to heighten awareness within NATO of the threat posed by Russia includes Poland, Slovakia, Hungary, Romania, Bulgaria, the Czech Republic and the Baltic States, Estonia, Lithuania and Latvia. Poland wouldn't mind seeing Trump as the advocate of Eastern European interests in Brussels. It's not just about a stronger NATO presence, but also about history and shared values. Many Poles see it as a given that the US should be responsible for their security as the country suffered at the hands of neighboring Germany and Russia in the past and felt cheated by other European states. The PiS government agrees wholeheartedly with Trump's climate and migration policies, as well as criticism of the German-Russian Nord Stream 2 gas pipeline project. And there are concrete economic interests, too: Poland buys US aircraft interceptor systems and liquefied natural gas, the latter in hopes to decrease its dependency on shipments from Russia. There is a bit of uneasiness with regard to the fact that during the election campaign Trump called NATO obsolete, and the sure knowledge that the US president meets with Russian President Vladimir Putin right after the NATO summit. But it doesn't shake Poland's great sympathy for the US and the people's belief that America represents safety and stability.